When delineating watersheds or defining stream networks, you proceed through a series of steps. Some steps are required, while others are optional depending on the characteristics of the input data. Flow across a surface will always be in the steepest downslope direction. Once the direction of flow out of each cell is known, it is possible to determine which and how many cells flow into any given cell. This information can be used to define watershed boundaries and stream networks. Regardless of your goal, start with an elevation model. The elevation model is used to determine which cells flow into other cells (the flow direction). However, if there are errors in the elevation model or if you are modeling karst geology, there may be some cell locations that are lower than the surrounding cells. If this is the case, all surface flow traveling into the cell will not travel out. These depressions are called sinks. The hydrologic analysis tools allow you to identify the sinks and then fill them. The result is a hydrologically conditioned elevation model. The following flowchart shows the process of creating a hydrologically conditioned elevation model from a digital elevation model (DEM). If you are delineating watersheds, you need to identify pour points (locations for which you want to know the contributing watershed). Usually these locations are mouths of streams or other hydrologic points of interest, such as a gauging station. Using the hydrologic analysis tools, you can specify the pour points. You can also use the stream network as the pour points, which creates watersheds for each stream segment between stream junctions. 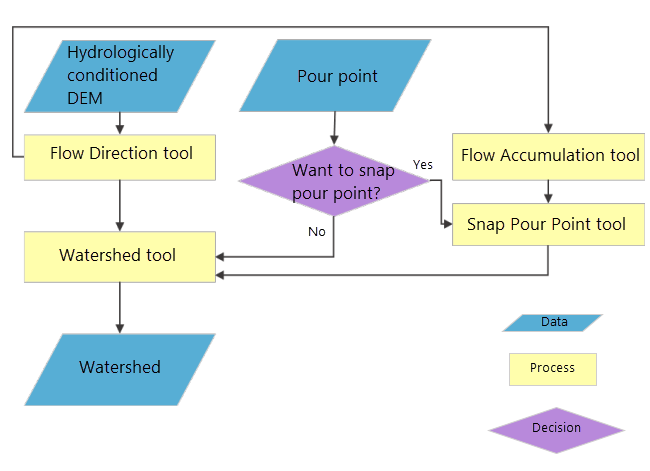 The following flowchart shows the process of extracting watershed boundaries from a hydrologically conditioned digital elevation model (DEM). To create the stream network, you must first calculate the flow direction and flow accumulation for each cell location. If you are defining stream networks, you not only need to know the direction water flows from cell to cell but also how much water flows through a cell, or how many cells flow into another cell. When enough water flows through a cell, the location is considered to have a stream passing through it. 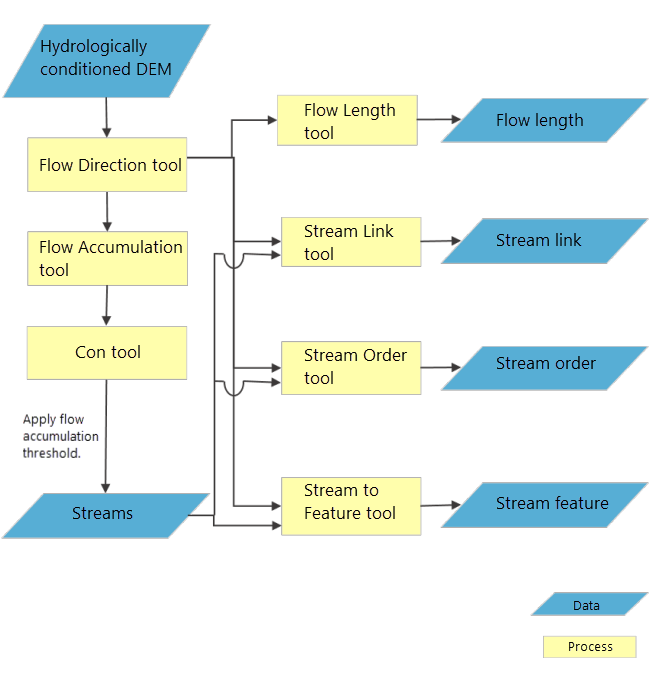 Once you have created flow directions and stream networks, you can use other hydrologic analysis tools to specify flow lengths, stream links, stream orders and stream features. 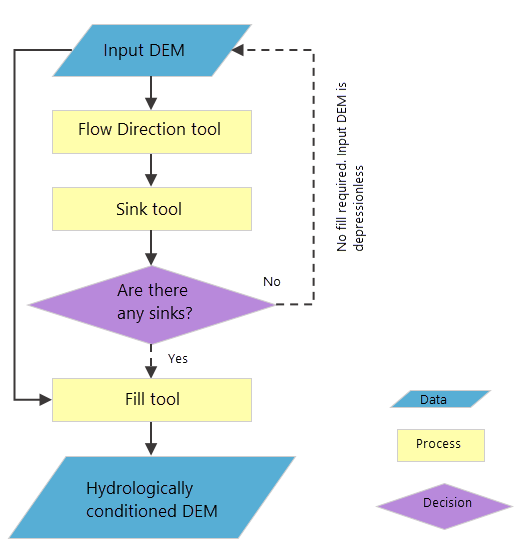 The following flowchart shows the process of extracting stream network and characteristics from a hydrologically conditioned digital elevation model (DEM). Stream network and characteristics flowchart.